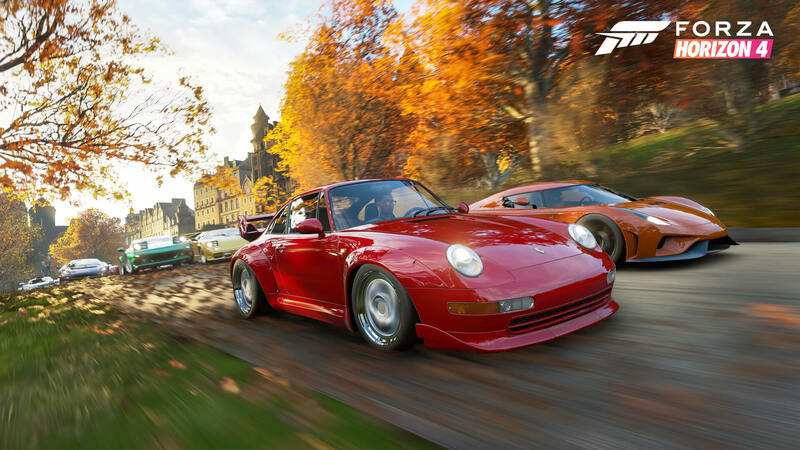 It’s almost approaching a full month since the launch of Forza Horizon 4, the shared open-world racing game from British developer Playground Games. 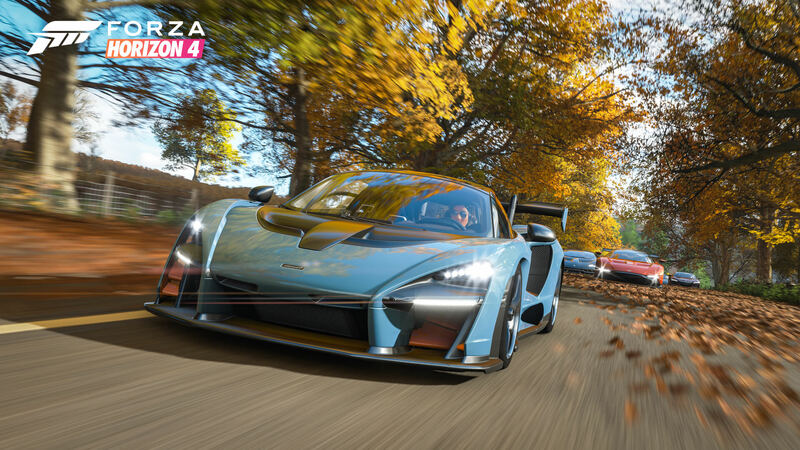 However, launch date was certainly only the beginning for this game, as every week, new content, events and challenges have been introduced with each seasonal change, and this week, the eagerly-awaited Route Creator finally made its debut in Forza Horizon 4 with a brand-new Horizon Story to complete. At the Forza Horizon 4 Goodwood launch celebration, I had the chance to catch up with Ralph Fulton, Creative Director of Playground Games to discuss the launch of the game and its post-release support, as well as the team’s decision to take the Horizon Festival to Britain, the driving factor behind its shared open-world experience, and how Playground Games aims to keep the game fresh and alive with weekly content expansions and by remixing the beloved Showcase events in Forza Horizon 4 so they can be replayed and enjoyed over and over again in the future. You could easily see the delight on Fulton’s face however. It was the day after reviews for Forza Horizon 4 hit the internet – and they were extremely positive. Critics adored the latest installment into the Forza franchise, praising its execution of a shared open-world, as well as its take on beautiful, historic Britain. 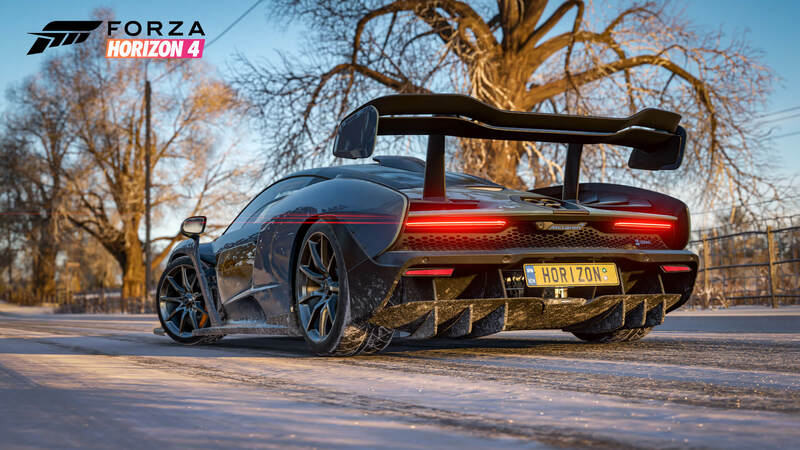 After two years of hard work, Forza Horizon 4 had earned a 92 on Metacritic – making it the highest-rated Xbox One console exclusive yet, and one of the best-reviewed titles of 2018. It wasn’t just the reviews that made Fulton happy, however. It was also everything that surrounded us. We were inside an exquisite parlour room inside the tranquil Goodwood House. Inside the main hall were several hands-on Xbox One X stations where attendees could enjoy the competitive-inspired Team Adventure mode and Horizon Life freeroam. Another room nearby had multiple simulation setups where you could play Forza Horizon 4 with a Fanatec force-feedback wheel – including one which boasted a hydraulics system. 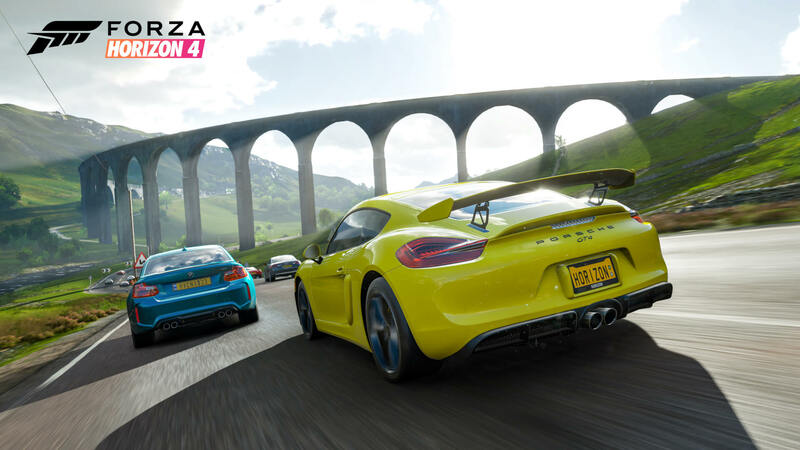 Microsoft had even made a dedicated creation room for influencers where they could capture gameplay of Forza Horizon 4 and livestream it directly onto Mixer, Twitch and YouTube. 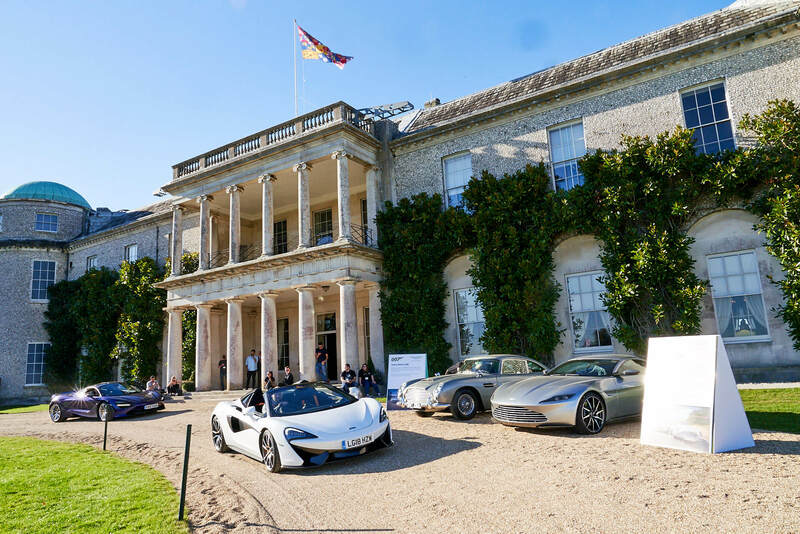 However, it wasn’t just what was happening on the inside – what was taking place outside on the grounds of the Goodwood Estate was even more spectacular. The entire area had been transformed into a Horizon Festival. 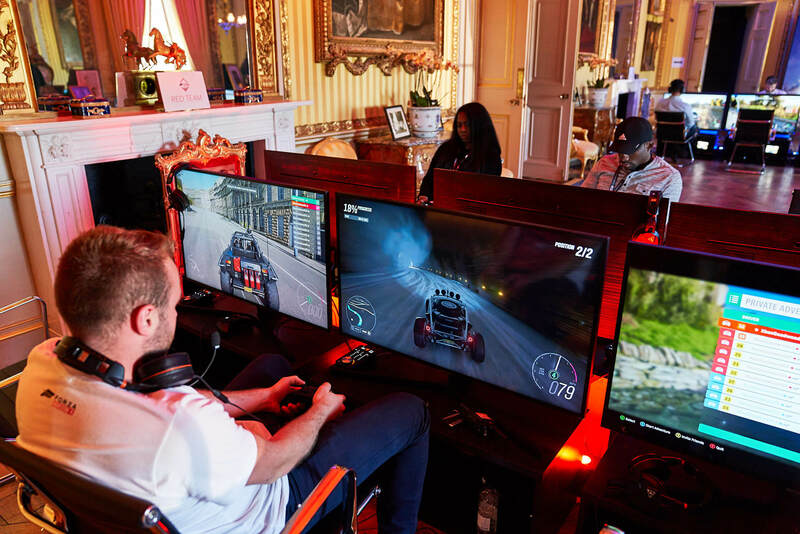 McLaren supercars and James Bond classics were seen parked around the ever-so famous house, whilst the surrounding countryside played host to numerous Forza Horizon 4-inspired activities, including a seasonal rally experience, a Ford Raptor versus Hovercraft showcase, a hot air balloon ride, country lanes driving in a Land Rover Defender, and a supercar shootout featuring some of McLaren’s latest and greatest automobiles. It was truly British and acquaint to the Horizon Festival, and the perfect way for Microsoft to launch its latest open-world racing game. 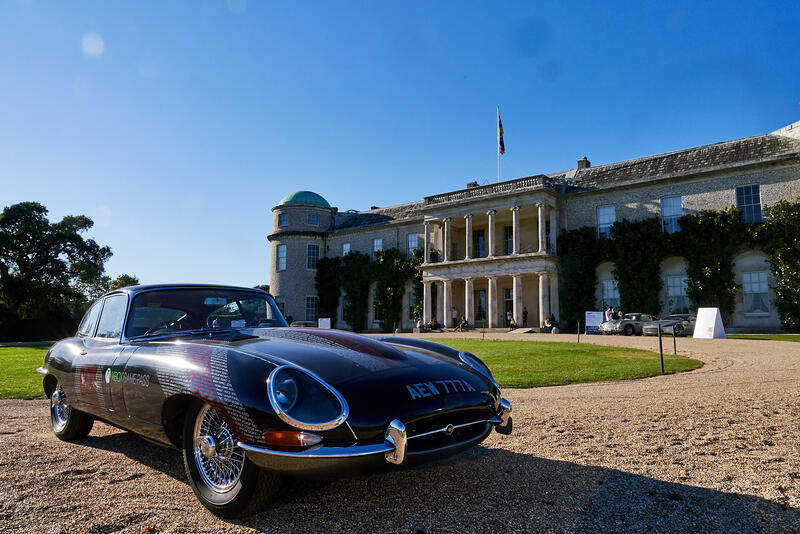 Being the spiritual home of car culture in Britain meant it was no surprise that the Goodwood Estate was surrounded in a vast fleet of supercars. From the latest McLarens and Ferraris to Lamborghinis and Aston Martins, it was a truly wonderful sight to see from both the perspective of a Forza Horizon fan and a supercar enthusiast. It meant I had to ask Ralph about which of the cars he would take, and I certainly agree with his pick of the bunch. Like Ralph, my favourite of the cars at Goodwood should be no real surprise. 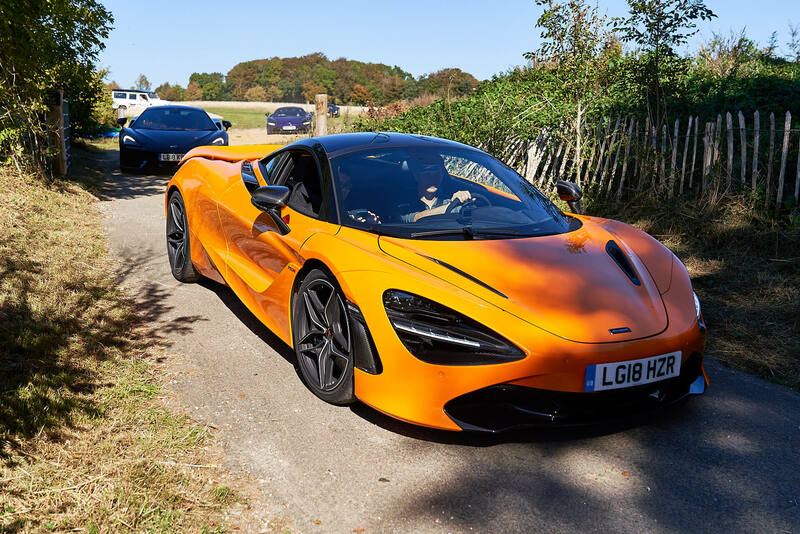 I was given the rare opportunity of siting inside the passenger seat of a McLaren 720S to experience its incredible acceleration and speed down British countryside roads at up to 120mph. Not only did it allow me to feel the adrenaline rush and excitement of a supercar at high-speed, but it also reminded me of how authentically Forza Horizon 4 captures Britain. From the small, acquaint villages and cottages to the winding country roads with flocks of sheep in the fields nearby, it was all quintessential British in the best way possible. It’s no secret that Forza Horizon 4 will continue to evolve and improve in the months and years ahead. Developer Playground Games has a robust slate of post-launch updates and content expansions in the works for Forza Horizon 4. 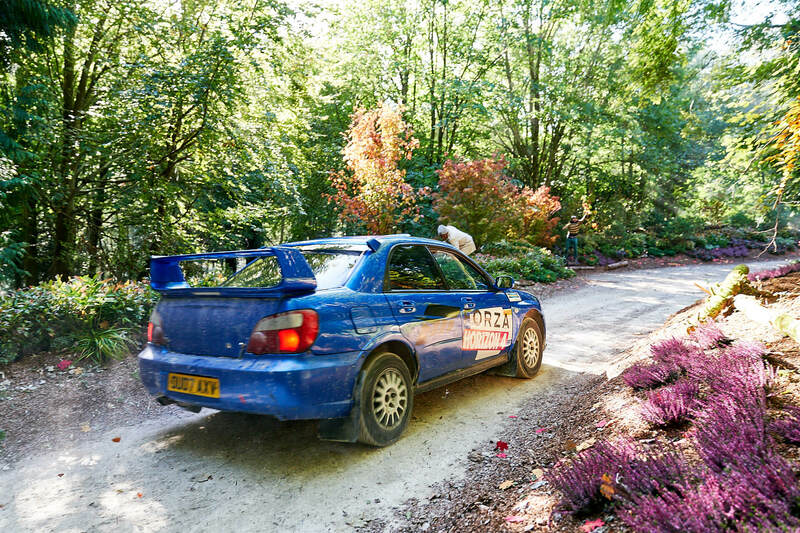 With each passing season, new experiences will light up for players in the form of new cars, events and challenges – as well as vastly different takes on beautiful, historic Britain made possible due to the unique differences and quirks of different seasons in the year. This means Forza Horizon 4 is designed to feel fresh, new and exciting when you log into the game every week – but the post-launch plan for the game doesn’t stop there. Recently, the team at Playground Games pushed out its first major post-launch update for Forza Horizon 4 – officially dubbed as the Route Creator update. This feature allows aspiring route designers to create custom courses of up to 40-miles in length from any Asphalt, Dirt or Cross-Country event starting location. Players can simply drive their car to draw a custom route, and place checkpoints wherever they desire. You can also rewind should you need to change the direction of a route, perfect its racing line or remove an unwanted checkpoint. That Horizon Story being referred to by Fulton is the ‘British Racing Green’ storyline, which explores a century of cars built on the Great British Isles. It’s accessible to everyone for free in the village of Broadway once you’ve hit Level 50. Playground Games will continue to introduce new storylines into Forza Horizon 4 that explore different aspects of car culture, as well as the wide variety of vehicles that are present in the game – including more quirky ones, such as the Austin FX4 London Taxi. 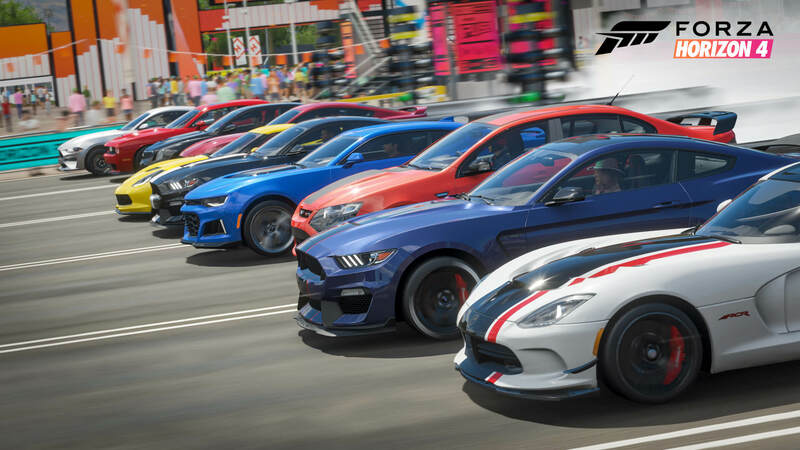 Keen-eyed players should remember the buzz from E3 2018 in June surrounding the possibility of owning a taxi business in Forza Horizon 4 and the ability to pick up pedestrians and drop them off at designated locations. Inspired by Crazy Taxi, these fares would be yet another way of earning credits in the game whilst allowing you to explore one of the more peculiar British cars in Forza Horizon 4. However, when the game launched on October 2nd, none of this was to be seen – but it isn’t too far away either. I asked Fulton about the hyped-up business, which made a lot of headlines at E3, and he revealed that’ll be coming sometime in the future. With additional Horizon Stories and businesses to be added in the future, as well as all those new new cars, events and challenges with every seasonal change, they’ll always be a recurring cycle of new content for players to check out and become engaged with – but as you likely suspect, that certainly isn’t everything. 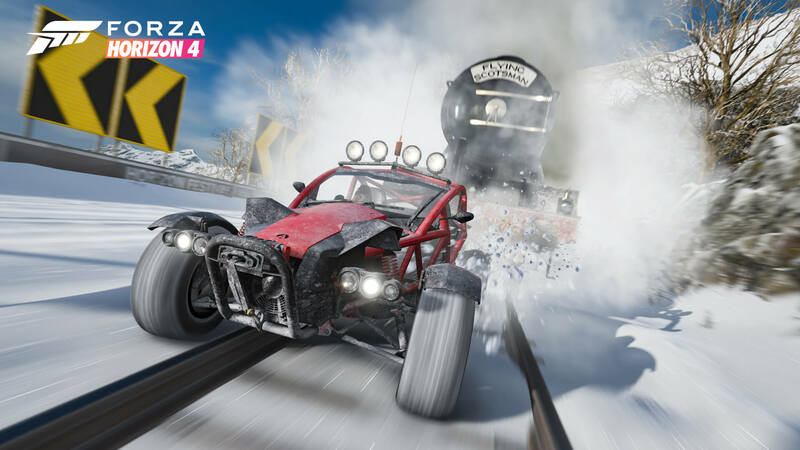 Playground Games will also remix the beloved Showcase events in Forza Horizon 4 in the future, allowing players to experience them in different seasons and other vehicles with unique weather conditions and an adjusted time-of-day, as well as an alternative music selection from the soundtrack – keeping the spirit of these events alive, whilst allowing them to feel fresh, different and enticing to replay. This idea to constantly evolve, refine and enhance the game is brought together and delivered through Horizon Life – the shared open-world experience in Forza Horizon 4, which sees you exploring beautiful, historic Britain with up to 72 players. It’s quite a surreal moment when you meet players and interact with them for the first time. Whether you’re complimenting their ride using the new Quick Chat social feature, drifting together in tandem, completing events and challenges in co-op, or helping each other find Bonus Boards and Barn Finds, the Horizon Life is one area of the game that’s truly special – and whilst Forza Horizon 4 isn’t the first shared open-world game by any means, it’s certainly one of the best takes yet on the concept. It was nearly time to wrap up with Ralph, but before I did – I had to ask to about the future. 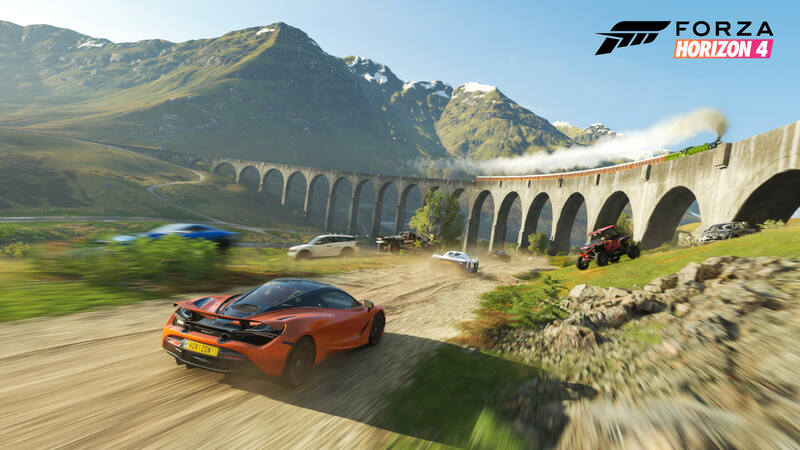 What’s next for Playground Games, and what’s in store for Forza Horizon 4 in the months and years ahead. The studio was acquired by Microsoft at E3 2018, and it has a brand-new open-world AAA action-RPG in the works, which is being exclusively developed by a standalone team in Leamington Spa. Fulton is also involved with the project, and the team has been hiring many well-known industry names to work on this new action-RPG title, but as you can imagine, he remained tight-lipped about it – especially since the spotlight for this event was naturally on Forza Horizon 4. I mentioned to Fulton that a lot of people were speculating Goodwood as a potential expansion for Forza Horizon 4, considering the launch event was being hosted at this spiritual home of car culture and automotive heritage in Britain – but he was quick to shoot down the idea. This was certainly a good opportunity to follow up with an expansion idea of my own – Ireland. It’s one of the British Isles, it has almost identical weather conditions to Great Britain to make it a perfect match for seasons and has some of the most beautiful countryside locations and landmarks in the world with spectacular, clear driving roads that would go wonders with the fast, exotic supercars of Forza Horizon 4. Will it happen – or should it even materialize? That’s up to Playground Games. I’d love to see their take on my home country and all its natural beauty, but I’m sure they’ve some excellent ideas in-mind – especially since Forza Horizon 4 should have more than two major post-launch expansions, based on Ralph’s comments from earlier. 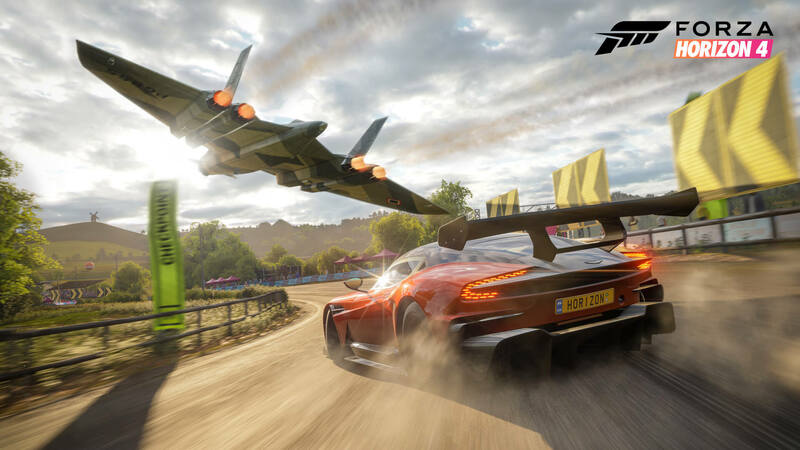 The first two expansions will introduce a new world location, vehicles and gameplay, and both are included in the Forza Horizon 4 Ultimate Edition. The first is slated to be released this December, whilst the second is expected in the first half of 2019.